LARGE & CLEAR 4 LINES DISPLAY - RISEPRO® Bike Computer offers you a large & clear 4 lines display. Easily and clearly view your cycling data at a glance! TWO BIKES SETTINGS & DATA COMPARISON - This newest model allows you to pre-program all settings for two bikes (Bike A and Bike B). No more re-setting between 2 bikes! Great for comparing recorded data between Bike A & Bike B for training and other purposes! MULTI UNIQUE & USEFUL FUNCTIONS - Typical functions highlight: Odometer, Maximum Speed, Average Speed, Driving Time, Calorie Consumption, Speedometer and etc. RECEPTION RANGE & COMPATIBILITY - 60cm range between Bike Computer & Transmitter ; 1cm range between Transmitter & Magnet. Compatible with bikes, electric bikes and motorcycle with 4 - 40 inches wheel. 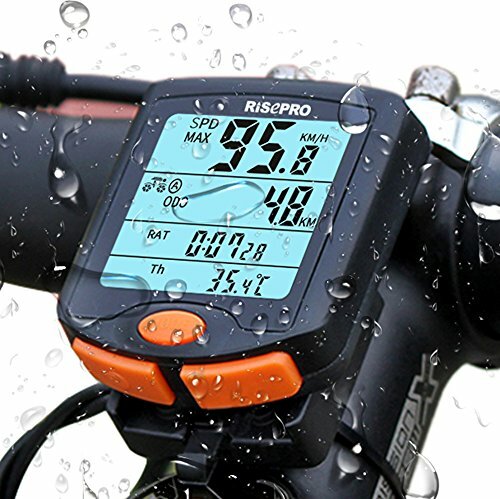 BACKLIGHT & WATERPROOF - This advance cycling computer is designed with backlight for night riding and waterproof against raining and wet condition. Works anytime and any weather!